Considered Mother Nature’s very own health spa since Biblical times, the Dead Sea is one of the richest sources of concentrated minerals on Earth. With this in mind, the experts at Dead Sea Healthcare have used the finest ingredients nature has to offer in its new grooming range for men. 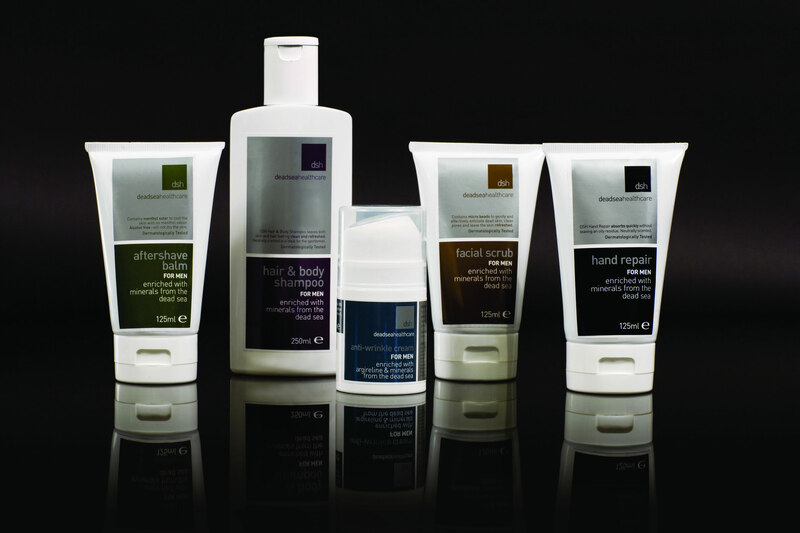 The neutrally scented DSH range combines the latest cosmetic technology with the mineral-rich resources of the Dead Sea to provide a fresh approach to male grooming. It is the ideal range for men who want to look their best day-in and day-out! One of first hand repair creams developed just for men, DSH Hand Repair combines Dead Sea minerals and black mud to help prevent dryness and heal rough, cracked skin. This product is neutrally scented and absorbs into the skin quickly without leaving an oily residue. Dead Sea mineral salts stimulate the circulation to boost the skin’s ability to refresh and renew - increasing the tissue’s capacity to absorb moisture and smooth the skin’s appearance. DSH Facial Scrub also contains anti-oxidant rich green tea extract and uses micro beads to gently exfoliate dull skin cells and pores. For best results use after shaving to reveal fresh, bright new skin. An anti-ageing product which really means business! DSH Anti-Wrinkle Cream fights off signs of ageing using Argireline solution, considered the safe alternative to Botox. Efficacy testing has shown that if used twice a day, products containing 10% Argireline solution can reduce the appearance of wrinkles by up to 27% after 30 days. Stop ageing skin in its tracks! This gentle balm combats the irritations that come with daily shaving. Neutrally scented and containing revitalising Dead Sea Minerals, DSH After-shave Balm’s alcohol-free formula cools and soothes the skin without that dry feeling. Use every day for optimum results. Unlike other all-in-ones that can leave your skin and hair feeling dry, DSH Hair & Body Shampoo contains a specialised blend of conditioners that leave the skin and hair feeling super-clean, nourished and refreshed. This multi-tasking product is perfect for the man-on-the-go, ideal to down size your luggage when going to the gym or travelling. Containing invigorating Dead Sea minerals - use daily for smooth, revitalised skin! This press release was distributed by ResponseSource Press Release Wire on behalf of Pegasus Public Relations (Worthing) in the following categories: Men's Interest, Health, Women's Interest & Beauty, Sport, Retail & Fashion, for more information visit https://pressreleasewire.responsesource.com/about.